Our Cat Suites are Purrfection! Cats might seem pretty independent, but at Paws Pet Resort & Spa, we know they need just as much love as dogs. Our cat boarding accommodations are clean and comfortable, and all our feline guests enjoy regular and loving attention from our caring, experienced and certified staff. To provide them a safe and relaxing experience, our cat boarding guests receive their own special cat condos in a dog-free section of our pet boarding facility in Cheshire, CT. We’re convenient to Waterbury, Meriden and the entire New Haven county area. All of our feline guests enjoy their stay in one of our spacious two-level condos. We can expand our condo units can be expanded into two, three, or even four adjoining units for families with multiple cats or those who just prefer more room. 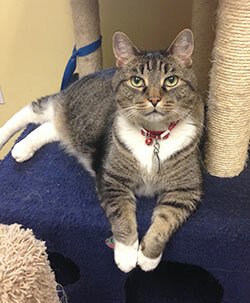 Our condos provide the comfort and safety for your cat which will give you peace of mind while you’re away from home. Our guests will be taken out for play and exercise daily unless they would rather just enjoy their “home away from home” at our Cat Boarding resort. Cat Boarding guests will be served nutritious meals twice a day. 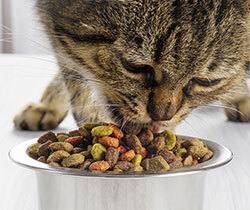 We serve a high-quality commercial diet cat food. You are welcome to provide your cat’s favorite food during your stay. Should your cat have special needs or dietary restrictions, we will provide a feeding schedule tailored to their special needs. All of our cat boarding condos are thoroughly cleaned daily and tidied throughout the day to assure guests comfort and cleanliness. All of our cleaning products used in the play and overnight areas are environmentally green to ensure the best care and safety for our guests and to protect the environment. All of our feline guests will have the opportunity to be King of the Cattery at least once per day to interact with a caring friend, play on the cat tree, or just sit on the window sill and watch the bird. Cats are independent by nature and lovers of attention all at the same time. The following additional activities and services provide you with a way of letting your cat get spoiled with attention while you are away. Cats enjoy interaction and being engaged. 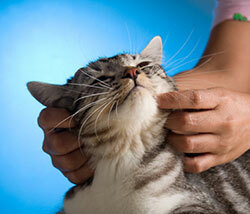 We recommend enhancing your cat’s stay with individual sessions devoted to what your cat enjoys the most. 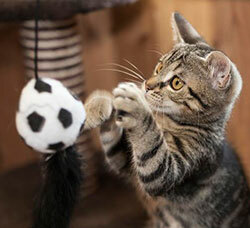 Does your kitty enjoy playing with a toy, chasing a toy mouse, laser or just being cuddled by an adoring fan? Just tell us what your furry feline likes to do and we’ll make sure it happens. Does your cat love the spa treatment? Then ask our Reservation Specialist about the Furry Rub treatment where our professional staff gives a great pet massage that will generate plenty of purring. New Clients Get First Night Free Boarding! Subject to availability and cannot be combined with other offers. Discount applies to first time customers only and valid for any lodging accommodation. Thank you for taking good care of Molly. She is so very special to us ad while we missed her while away, we didn’t worry about her. Although we don’t know you, we just knew she was in good hands. When we adopted her, we didn’t know she was a “special needs” kitty. Stray Katz offered to take her back but that was never a consideration. She is very special indeed. We want to thank you, your husband and your entire staff for taking such great care of Willow and Neo while we were on vacation! They came back happy & healthy – and we know they’ll enjoy returning. I could not be happier with our 2nd experience leaving Bruiser at Paws. I think he was more comfortable and calm. We also felt more at ease checking him on the webcam and were able to enjoy our vacation, knowing he was in good hands. I wish to thank all of you so much for all the kindness during my recent stay at your resort and spa. I really appreciated the rooms with a view and I certainly appreciated that extra attention & petting that Jenifer gave to me. I will be sure to all of my friends about your wonderful folks. Just wanted to say thank you for taking such good care of our babies. We appreciate it. It felt good to know they were being loved & cared for & given special attention.